Climate change is here and it’s here to stay, but fall is still cuffing season, baby, and personally, I can’t stop staring off into the distance and fantasizing at work about vacationing on a Hawaiian island with my sweet Latin trap boyfriend Bad Bunny. Before you yell at me because you’ve never heard of him, Bad Bunny is rapper from Puerto Rico and you’re either old or have bad taste in music (sorry!!!). It’s fine, though; really, it’s not a big deal because we’re about to remedy that together, in this blog. This is Bad Bunny. Whenever I see him, I smile without meaning to and think about what it would be like to stand next to him; do you think he’s tall? I’m not, so it doesn’t matter. He’s not quite buff, but he is quite handsome, and I love his tiny sunglasses and his colorful button-ups and cut-off shorts and I don’t care if you don’t. Did you know that the “Hey, I just wanted to take another look at you?” meme is actually about me, scrolling through Bad Bunny’s Instagram after I’ve just watched his new music video with Drake 50 times in a row? It is now. 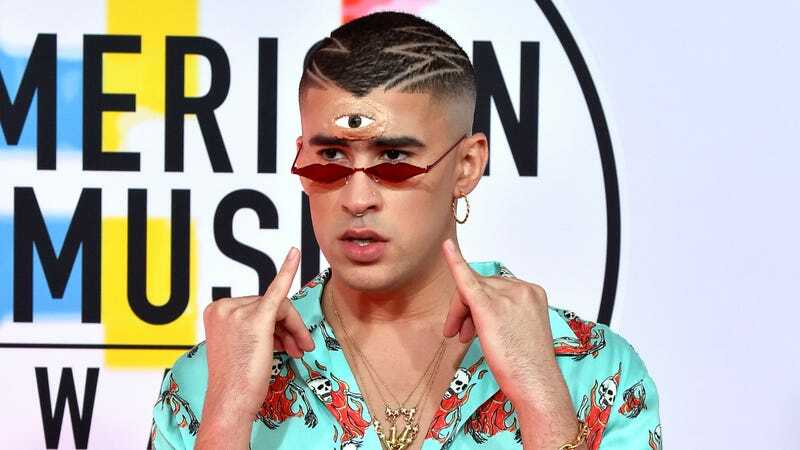 I have sometimes asked myself what it is exactly that I find so attractive about Bad Bunny. Yes, he wore a literal third eye to the American Music Awards (see above), and yet, friends, I still would. His haircut reminds me of Avatar the Last Airbender, and yet—ladies and gentlemen—as I mentioned, I can’t stop thinking about him. It’s not BDE—let’s do away with that term completely—but the way he is so frequently shirtless makes me think he has a wild and dirtbag spirit, while the tender looks he always throws the camera makes me think he has a big... heart, the kind that belongs to a nice guy who treats you right. Bad Bunny will show up to your first date with roses, only to reveal he doesn’t have a car. That’s a fabrication, obviously, because Bad Bunny is famous now, but I still think that if we were going to hang out, it would be at the mall. Listen, I’m not mad. I’m intrigued by that combination and I want to know more. What’s his food court order? How many floral-print shirts does he own? Does he speak any English? It’s okay, I don’t either. In short, Bad Bunny: I’m single. I’m on Instagram. Call me. Whatever. I hope everything is swell in Puerto Rico and I love your new song. That’s all I have to say, unless you have something to say, too. Be well.